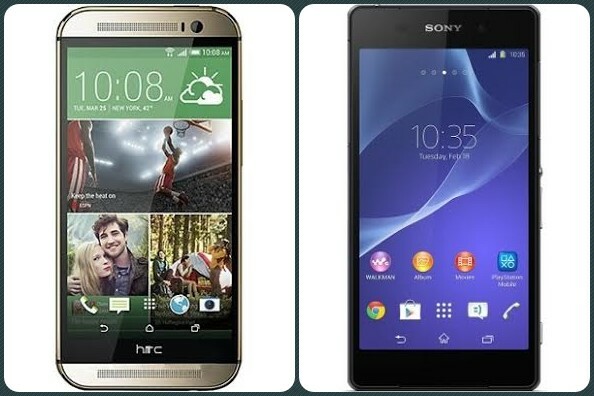 HTC One M8 VS Xperia Z2 - Select your new companion? While Samsung dominates the smartphone space, its lesser rivals namely HTC and Sony are engaged in a more vicious battle with each other. On one hand, the Taiwanese mobile major HTC has been able to put its troubles to rest with the very popular HTC One. On the other hand, the Japanese tech giant Sony is grabbing lots of attention with its very interesting mobile phones in the last couple of years. In terms of quality and features, both HTC and Sony offer great products. And now, these two companies are again going to be locked in a tough duel. HTC has recently released its new One (M8), while Sony is all geared up to launch the new Xperia Z2. Both the smartphones can be pitched against each other to see what they offer, but these are not just phones, they are the new technological warriors packed to the hilt with marvelous features, functionality, and cutting-edge technology, not to mention they are superior things to behold. The new HTC One (M8) and the forthcoming Sony Xperia Z2 are thus, brilliant devices offering stunning beauty with loads of brains. Wondering which smartphone to choose among these two? Just take a brief look at these two new beauties, before picking your new smart mobile companion. The HTC One (M8) offers a tad smaller 5 inch display than the 5.2 inch screen of the Sony Xperia Z2. Both the handsets offer the same 1920 x 1080 screen pixel resolution. However, as the Xperia Z2’s screen is slightly bigger it has little lesser pixel density. This minor difference is not really noticeable. If you are all for colors, then the Sony Xperia Z2 is the choice, as it is more vibrant, but at the same time it might seem little unrealistic to some. While, the Xperia Z2 wins on the size and punchy color front, it has one downside; that is while using the camera, in bright sunlight the display might not be visible if you are wearing polarized sunglasses. Then again, this is but a tiny point. When it comes to looks, both the HTC One (M8) and the Sony Xperia Z2 look stunning, with sleek, solid and smooth design that are meant to charm the audience. In terms of built quality also, both the devices offer premium built with tough and durable quality. However, both have different design approach. The HTC One (M8) offers a more curvaceous all-aluminum frame though very sleek and lightweight. The curves make all the difference as they make the handset feel very nice and comfortable to hold, also making it very practical to use. The Sony Xperia Z2 on the other hand, offers a very flat design with aluminum trim and tempered glass finish. The Z2 also comes with the patent awesome feature of being dust and waterproof. However, the flat design makes it a bit difficult to hold and use in daily life, while the extra bezel on the device’s top and bottom also feels unnecessary. Thus, though both are absolute lookers, the HTC One (M8) wins with a more practical design. The HTC One (M8) comes packed with Duo Camera at its rear, with an UltraPixel sensor to capture images, while a secondary lens measures depth. The fast and smart camera however, loses on the resolution front. The Sony Xperia Z2 offers a superb 20.7 Megapixel primary camera, with an array of smart features including 4K video capabilities that the M8 doesn’t have. The Xperia Z2 has the edge of great resolution and offers great crisp images with the flexibility of tons of amazing features. For the selfie lovers, the HTC One (M8) offers a better 5 megapixel front camera, while the Sony Xperia Z2 comes with a 2.2 megapixel secondary camera. Performance wise, it is really tough to choose between the two. The HTC One (M8) as well as the Sony Xperia Z2, both comes powered by the latest Qualcomm 801 Snapdragon and 2.3GHz quad-core processor. When it RAM is concerned, the Xperia Z2 wins with 3GB RAM over the One (M8) that offers 2GB of RAM. For the speed lovers, the Xperia Z2 is also a bit faster with heavy-duty apps. However, the One (M8) charms with an incredibly fast and smooth UI. Both the devices are also superbly powerful. While HTC One (M8) draws its power from a 2,600mAh battery, the Sony Xperia Z2 comes with a more powerful 3,200mAh battery. Who wins in the Memory game? Both HTC One (M8) and Sony Xperia Z2 come with 16GB inbuilt memory, and both offer the flexibility of microSD card slot. However, HTC One (M8) allows the storage expansion of up to 128GB, while the Sony Xperia Z2 can expand only up to 64GB. When it comes to Operating System, again both the HTC One (M8) and the Sony Xperia Z2, run on the latest Android OS version 4.4 KitKat. Sony has customized the OS packing in loads of Sony features and apps on the Xperia Z2. You can get tons of entertainment via the Z2 with Sony’s movies, music and gaming offerings. The HTC One (M8) packs in a fast and fascinating Sense 6.0 UI that is visually more refined than the previous HTC offerings. HTC also packs in lots great features as well. On this part, it really depends on personal preference as to which device takes the cake. The HTC One (M8) and the Sony Xperia Z2 both offer great functionality and features, and are really close. However the bottom-line is while the Sony Xperia Z2 offers slightly larger screen and better camera, the HTC One (M8) offers the advantage of a more practical design which really counts. At the end, it really depends on you when it comes to taking your pick.